Taro is the staple of the Native Hawaiian diet and at the core of the Hawaiian culture. Hawaiians believe the taro plant to be sacred. Taro, called “kalo” in Hawaiian, is central to the Native Hawaiian creation story. Taro is a plant with a broad, beautiful, nutritious strong leaf shaped like a huge heart. Imagine a completely hypoallergenic, versatile, mineralized, satiating vibrant tuber with unique and starchy richness and the ability to be made into everything from pie, to “burgers” and chips, to a smooth, purple-ish, creamy staple dish called “poi.” Even those who do not have the creation story of the taro in their heritage know that taro, in these islands that we love, is sacred. It is one of the single most well-know, important, and reliable plants in all of Polynesia, and the locals take a deep pride in its profound history. Various names for parts of the taro plant indicate its interwoven history with the Hawaiian people: the place where the stem meets the leaf is called the piko, or navel. The stem is the ha, the breath, and the cluster of shoots (or keiki, meaning children) that surround the mother plant are called an ohana, or family. Here in Hawai’i, the growing and cultivation of the kalo plant is a tradition that stretches back for more than a thousand years. The Hawaiians loved, honored, and cared for kalo and were in turn, as the creation story implies, fed and supported by it for generations and generations. By tending carefully the kalo, the Hawaiians eventually cultivated more than 300 varieties by selecting the plants for certain conditions, climates, and soils and by hand-pollinating over years and years. Why A Moratorium on GMO Taro? Threatens the taro market and livelihood of taro farmers. Taro production yields over 6 million pounds annually valued at $3.3 million. Overlooks the wealth of traditional knowledge about growing taro that has been passed down through generations and generations. This patenting of the plant required farmers wishing to purchase huli, or breeding stock, to sign a licensing agreement with UH. The licensing agreement stated that “UH owns the taro cultivar…” It prohibited farmers from selling or breeding the patented plants, and required the payment of a royalty to the University. In 2003, UH, in conjunction with the Hawaii Agriculture Research Center (HARC), began genetic engineering three varieties of taro. They experimented with inserting rice, wheat, and grapevine genes into the Chinese (Bunlong), Hawaiian (Maui Lehua), and Samoan (Niue) taro. Researchers did this quietly without any permission or input by the Hawaiian people and when locals realized what was happening they became outraged. There were months of protest, letter writing, phone calls and organizing. Maori, Paiute, and Hawaiian activists spoke on 4 islands to Native Hawaiians about the impact of GMOs in their communities. Walter Ritte, Native Hawaiian activist from the island of Moloka‘i and friends held a ceremony for Haloa (to protect the taro), pressuring the Dean of the University of Hawaii Andrew Hashimoto to sign a moratorium (end) on GE research of the Hawaiian taro. The University tried to compromise by forming a “bioethics panel” or Native Hawaiian advisory board, but unfortunately members of this “board” that the University hand selected were biased liaisons of UH with a vested interest in promoting GE taro to the Hawaii people. Native Hawaiian Walter Ritte and taro farmer Chris Kobayashi, with the help of Center For Food Safety, present a letter to the University of Hawaii demanding UH drop their patents on taro. Read the letter. On May 18, 2006, native Hawaiians chain the doors of the new UH medical building, demanding an audience with decision-makers at the University of Hawai’i. See a video of the protest. Though UH agreed to stop genetic engineering experiments on the Hawaiian varieties, they continue to manipulate the Chinese Bunlong variety of taro under the direction of Dr. Susan Miyasaka and the Dean of CTAHR, Andrew Hashimoto. Researchers hope to make the taro resistant to a fungus (phytophthora). This overlooks the causes of disease and fungus problems with taro: poor water quality, lack of water, lack of diversity, and the loss of the knowledge about the traditional, organic, healthy growing techniques. Such GMO research continues to disregard Native Hawaiian cultural concerns and could lead to economic devastation of the taro market. Native Hawaiians, taro farmers and Hawaii SEED continue to fight back by supporting legislation that places a moratorium on the cultivation and experimentation of GMO taro in the lab and field. You can too. 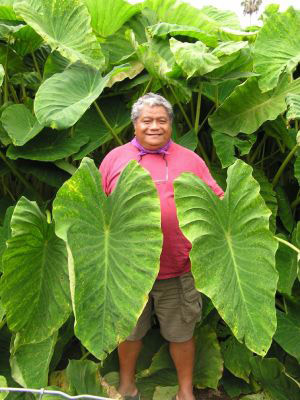 In the legislature’s 2007 session, a bill instating a moratorium on GE taro research passed all the way through the Senate, generating a great deal of dialog, media coverage, and new connections between Native Hawaiians, Taro Farmers, and elected officials. Farmers, Native Hawaiians and concerned citizens flew in from all islands to offer hours of collective testimony in support of this bill which clearly affected the captive audience of elected officials. SB958 Passed through the Senate and moved to the House where Representative Clift Tsuji, Chair of the Agricultural Committee refused to hear the bill this session. Native Hawaiians and Taro Farmers went to the legislature in protest and continue to call for legal limits on genetic modification of taro until this day. The passage of Act 211 by the 2008 Hawai’i State Legislature established the Taro Security and Purity Task Force. This Act directed taro farmers, agencies and University of Hawai’i representatives to seek solutions to challenges facing taro, taro farmers and taro markets. Funding and administrative support from the Office of Hawaiian Affairs enabled the Task Force to meet consistently and to gather input from taro growing communities on all islands over the period of the last 12 months. This effort and the report which follows represents the first time that guidance for taro, taro research, and solutions to problems taro farmers are facing comes from the real experts – farmers – and from the taro itself. It is precisely this perspective that has been missing from the table for decades. The in depth experience and knowledge of the taro community combined with the resources of state agencies and the University of Hawai’i strengthen and balance the necessary relationships between all stakeholders as we seek to revitalize all that taro is and can be again in Hawai’i – from cultural legacy and ancestor to vibrant economic and food crop self-sufficiency. The report contains a critical section called concepts of importance, which includes definitions of taro security and purity, descriptions of the taro farmer life style, the importance of taro to Hawaii’s identity, taro as a centerpiece of Hawaiian culture, its role in agriculture, and how current land designations impact on the cultural continuity of taro and its ability to contribute towards food self-sufficiency. These concepts are essential for legislators, agencies, institutions and researchers to grasp prior to engaging in work and decision making related to taro farming. Understanding what is at risk is critical to re-valuing taro and its role in the well being of the state.